When organising the second edition of the City of Literature Creative Writing Course, devoted exclusively to crime stories, we devised an intensive course for twelve participants to prepare them for an aggressive marketing on the publishing market. During ten weekend session the young writers met with Katarzyna Bonda, Katarzyna Puzyńska and Mariusz Czubaj. They listened to lectures given by the writers, participated in activities with a creativity psychologist, an expert in copyright, were offered consultations with leading editors who work for Krakow-based publishing houses, discussions with literary critics, and presentations by an expert in public speech and a specialist in literature marketing. Even a police profiler was involved, talking about the creation of credible characteristics of a crime novel hero. Editing exercises and hard work under the guidance of Filip Modrzejewski, an editor working for W.A.B publishers ,who has cooperated with Zygmunt Miłoszowski for years. Our course participants found him an invaluable guide to show how to create a real jewel in this genre of novel. The last project – writing a crime story based on what they had learned – was test of the young writers; aptitude. 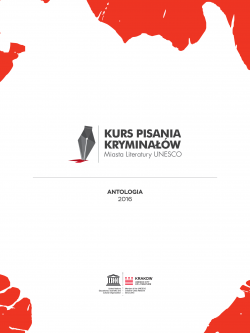 As a result you can find twelve extraordinary stories in our Anthology which you can read on the Course website (www.pisz.miastoliteratury.pl). The book begins with four award-winning stories. Bartek Borucki Astronauci is a literary reference to Whiplash!, i.e. a sophisticated story about a very special; artistic and musical adventure. Paweł Graczak’s Przez krew is a story going beyond a classical crime story genre, skilfully combining thriller and a horror story. Joanna Łopusińska’s Zderzacz albo zimowa opowieść is a well-thought-out, slowly unfolding narrative puzzle with a splendidly sketched real life background.. Jakub Trzeciak’s intriguing, full-blooded story Demony shows that the young writer promises to grow up to become a popular author. All the Course participants whose stories can be read in our Anthology are highly recommended to readers and publishers. We strongly believe that the will match the success of the participant in our first Course edition – Ashen Rid Hassan – who has already cooperated with three publishing houses and the greatest Polish literary agency, Book Lab. His books – his debut Weimar ([published by Novae Res), the fantasy novel Trupojad i dziewczyna (published by. Genius Creations), as well as the story Eksplozje (published by Wielka Litera) have earned him a faithful group of readers, showing that good writing is a skill to be learned. We believe that the participants in this year’s edition will have similarly impressive achievements. So get down to reading! The curriculum of the course was conceived by Karolina Macios and Magdalena Zielińska – highly experienced editors what a many-year experience. The course is part of our programme in support of literary debuts in Krakow as a UNESCO City of Literature. The annual Conrad Award for the best debut is also part of the programme to pave them the way to further literary career, as well as monthly weekend workshops for prose writers, journalists and reporters which organised under the Creative Writing Course. Young writers can also participate in open meetings with editors who acquire Polish prose for the largest publishing houses, an experience which will certainly expand their knowledge.. All the above-mentioned events herald the third edition of the Creative Writing Course to start in October. Interested in participation in our activities and meetings? Please contact Oliwia Fryc: ofryc@biurofestiwalowe.pl on the Creative Writing Course, Anthology and publication matters.